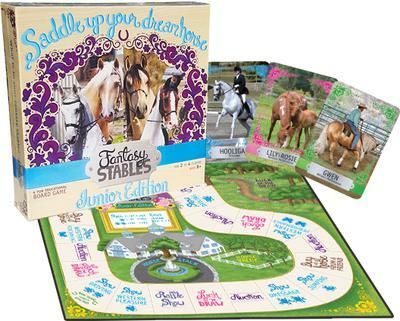 My sister and I created a board game for people who are crazy about horses! We have two games, one for kids ages 8+ and one for teenagers and adults. Our games have 50 beautiful pictures of real horses in both English and Western style disciplines, and as many different breeds and colors as we could find. 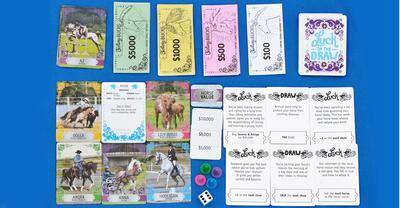 Both games are all about collecting horses, showing horses, and learning too! You start with horses and cash, but you have to outbid your friends to keep adding to your stables! All the players can play together on most of the turns, so it's more exciting to play than many other board games. During the shows choose your favorite horse and hope they are having a lucky day so you can win the cash jackpot! One player called it "Like real life on the ranch!" I want to play this game so much! It looks so.. well.. horsey! And fun! Sounds great! 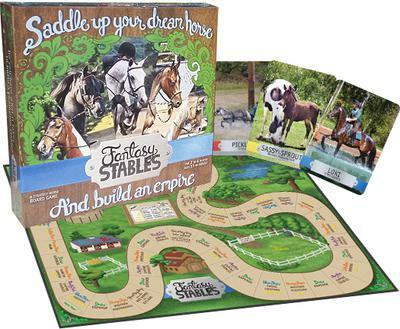 This seems like a horse game that is realistic and I like that it's designed by kids. Adults don't always get how kids want to have fun. 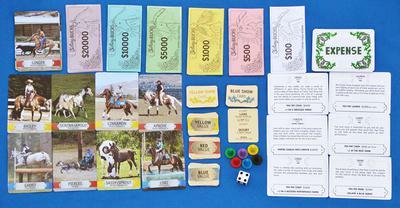 My sister and I grew up playing horse games of all kinds and we've always loved board games. We wanted to create a better game- one that was more interesting and realistic for horse lovers! We wanted our game to be more social than other board games and we love how exciting the game play turned out. To start we knew we wanted to create a game where real horses are the absolute center of the game - beautiful horses that would be a dream to own. So to begin the creative process we started taking pictures at local horse shows and then sorted through thousands of pictures in different disciplines to choose the ones that we loved the most. Since we made a realistic game the game play came together pretty easily. We had a really good time making the game and even after playing hundreds of times to game test it we still love to play. It took about two years from our original idea to getting our first games from the printer this winter - which was absolutely thrilling! We got our first shipment a few days after Christmas so it felt like Christmas came twice last year. We were really lucky to grow up with horses, we had our first pony when we were 5, and our passion for horses has only grown from there. We really enjoyed 4-H when we were kids, and currently we own 5 horses. Ana's horse Knight is a 5 year old smoky black Andalusian/Appaloosa gelding, he's 16.1 hands and as sweet as they come. We've had him since he was a weanling and Ana has done extensive ground work with him for years so his under saddle training is really, really easy so far. Ana is starting him in Driving, and eventually she'd like to compete with him in Combined Driving Events. We also own two horses that are featured in the game - Serena and Amigo. Serena is a grulla overo Sorraia/Paint mare, she's only 15 hands and she's an excellent trail horse - she never puts a foot out of place. Amigo is her 2 year old palomino sabino gelding son - we bred her to a Lusitano to get more size and spirit - and we definitely got the spirit part! Ana has her hands full working on his ground manners, but he is a neighborhood favorite to pet because of his sweet face. His registered name will be Amigo del Diablo! Keshia hopes to compete with him in 3 day eventing some day. Scout is a chestnut few spot leopard 15.2 hand Appaloosa mare - we call her Scouty the Sturdy because she's built pretty solidly. She will be featured in an expansion pack of the game, we did a fun photo shoot at the ocean with her. She has a classic Appaloosa personality, and we love her for it. Foxy is a 15.1 hand black and white tobiano Paint, and she is a true alpha mare. Very spoiled and bossy, but with a heart of gold and she LOVES to go riding - in any weather, any time of day and anywhere. We know we have "too many" horses but we love them all and enjoy how they keep us busy!